PayPal joined in the Facebook craze and created a user-friendly Facebook app that allows users to send money to their Facebook friends. Aptly called Send Money, this app added a different twist on how Paypal users usually send and receive money. Instead of the usual email notification that you had sent money to your recipient, you know have a fun and cool way to do it. 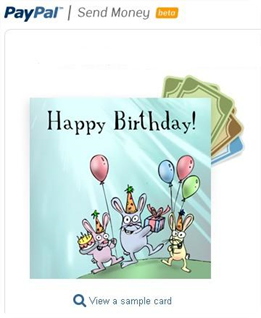 Send Money allows you to attach greeting cards where you can also add a personal message along with the PayPal money you will send. The greetings cards are quirky, bright and can really send a smile. The e-cards can also contain pictures and videos that are perfect way to greet someone a happy birthday or a happy anniversary. The e-cards are posted to your friends’ Facebook wall but the messages will be kept private. There is also an option to just send money without using the e-cards. This new app is a very good and timely marketing move since 80% of Paypal users also use Facebook. This is another proof of the rising relation of e-commerce to social media. Sending money to friends as a personal payment (person to person) will entail no fees. You do not need to pay any fee if your PayPal fund is linked to your bank account and not with your credit card. In the Philippines, where a lot of people are using Facebook as store front to sell products, this is a good application that they can take advantage of. Users now have the convenience of shopping on Facebook and send PayPal money all in one site with just a few clicks of the mouse.